The Youth Co "Airliner" Frames are a solid frame designed by three of the top professionals in our industry(Chris Haffey, Chris Farmer, and Jon Julio). They went through many different test samples of the frames in order to find the perfect materials needed to withstand their day to day abuse. The Youth Co "Airliner" Frames are a light weight frame with built in frame spacers. That helps keep the weight of the frame at an all time low. The frames have a large h-block split, so it's much easier to lock onto grove tricks, and to stay locked for a longer period of time. The frames are perfect for riding flat, anti-rocker, or freestyle. The frames also include all the necessary mounting hardware/axles as well. Doesn't not include bearing spacers. I ordered Youth Airliner Frames for two reasons. 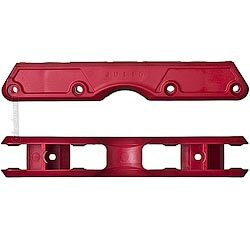 Price Point: The price weighed against Ground Control frames were a huge benefit to me, especially since what I really needed was a red frame. The Names behind the Product: Chris Haffey, Chris Farmer, and Jon Julio are U.S. Industry legends. If they're willing to get behind the product, I'm willing to give it a shot. Out of the box the packaging is great. I'm coming from skating exclusively Ground Control frames and I'm used to getting a nice little bag (which is cool, don't get me wrong) but the box design is simply and effective. Out of the box the Youth Airliner frames are light weight and clean. The things look good. I threw some Large frames on Razors SL Korey Pros Size 8-9 Boot and they fit fine for my application. Threw some Wicked Abec 9s on some Eulogy Haffeys and hit up my friend's practice box. The frames sit nice and low, so hitting the BS plate and getting nice low, consistent Royales and Torque/Farfs is simple. Topside tricks slide very well too, despite the rail being sticky due to the galvanized goo stuff being underneath the wax. There's no rocker adjustment on these frames, but that's not a huge thing these days anyway. Wheel spacers are built in, which seems to be the industry standard now. One thing I like that others may not, is that the construction FEELS less dense than Ground Control frames. But so far I haven't run into any problems. Youth Airliner Chris Farmer Pro Frames S ONLY!